I’ve always wanted to be more “put together.” I want to have good hair. I want to have a spotless, organized house, one that doesn’t have spaghetti sauce and bike grease on the walls. I want to cook healthier meals and read more books. I want my toddler to say “Please” and “Thank you” as regularly as he screams “NO!” I want my writing career to really take off, so much so that editors will respond to every email and pitch instead of one out of ten. I want all these things very much, and many more. It all seems so easy, looking at what other people have and you don’t. It’s taken me 31 years to realize the truth behind that obvious lie—whatever you do, if you’re going to do it well, it takes a lot of energy. For the last 10 years or so, my workout is what I get done during the day, come hell, high water, or a bad case of the sniffles. First it was running, then briefly triathlon, and finally my ongoing, roller coaster love affair with bike racing. In the beginning I cultivated the obsession with sport to lose weight (in college I’d packed on 20+ lbs), but later my workouts became something else entirely, a compulsion that had nothing to do with balancing out the day’s dessert menu. Competition is at its heart, and most of all, meeting expectations. That’s another way of saying, I guess, that I’m striving for perfection in this, perhaps more than all other things. The State ITT was something of a debacle. Other people might say they’d be happy with my time. But you know what? I bet they have great hair. Or maybe a really high-paying job, or a spectacularly polite child, or a house that doesn’t perpetually look like they just moved in. I probably sound like I’m complaining a lot this year, but when you know that you’ve actually given everything your all—the training, the preparation, the necessary equipment—it’s hard not to feel a sense of betrayal when your careful plan melts away like a popsicle in the Texas sun. 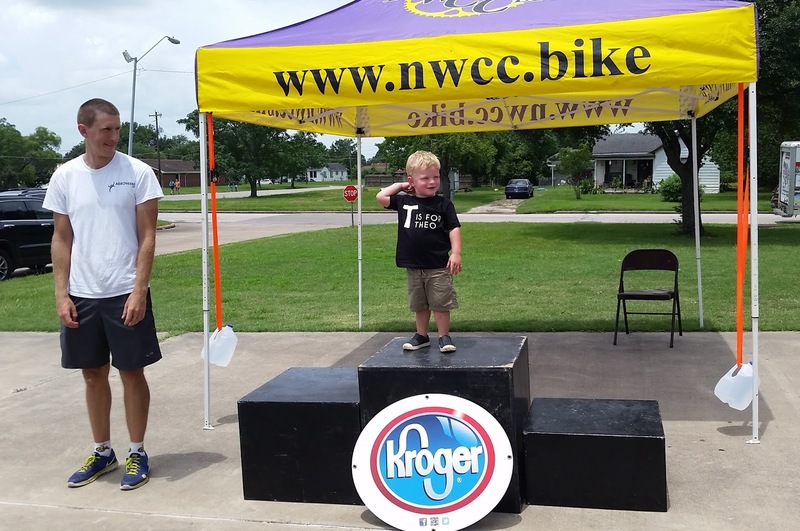 The State Time Trial Championships, put on by the Northwest Cycling Club, were held in Hempstead, a small town about an hour northwest of downtown Houston. The 40K course was basically all flat, fast road: an out-and-back with a 180-degree turnaround. Saturday was the individual TT and Sunday was the team TT. Both days it was windy, with a headwind for most of the way out and a tailwind for the return. But there’s one word that describes this course best in mid-June, trumping everything else: HOT. The air was thick and humid, with the temps probably in the 90s around my late-morning start. (I’ll go ahead and say, with no small amount of jealousy, that I think the riders who went earlier had a much easier day of it.) About two weeks before I’d had an episode with heat exhaustion—my first ever—when I was riding with a fast friend in East Texas. I’d suddenly started feeling nauseous and weak mid ride, with on-and-off cramping in my lower back. Hours later I’d thrown up and felt awful for the rest of the day, with what felt like a hangover the next morning. The episode seemed crazy to me because I’d worked out hard in much hotter temperatures before, but hot weather has come very suddenly to Texas this year after a mild spring, and I’d spent a few weeks racing/traveling out of state. The best I could figure was that I still wasn’t acclimatized. This TT I certainly started out with more respect—verging on fear—for the kind of havoc heat could play on my body, but it still wasn’t enough. My goal was to hold 260 watts average. I’d had a couple of good runs at the Castroville TT the previous weekend and in May, and I was expecting this course to be faster. With the heat, though, I probably should have started at 250 and just done my best to hold that. Instead I’d let the average power creep up to 265, feeling great, until all of the sudden I wasn’t anymore. Racing in the heat seems a lot like racing at altitude. If you go a little too hard you won’t be able to recover, and sometimes you don’t realize what that point is until you’re past it. Five or six miles in I was painfully aware of my mistake. Soon I was doing good to hit 230 watts, and from that point on it was the most miserable TT I’d ever done in my life. A TT is by nature already awful, but add to that the fact that a) it’s hot as blazes, b) you still have forever to go, and c) you know you’re going to have a much slower time than you were aiming for, and then you’re pretty much looking for any excuse to stop and just lie down on the side of the road. If I’d seen a nice, sharp-looking bit of road debris, I might have run over it with gusto; with my luck, though, all that was available was a flattened possum. I’d wanted something that would show the fitness gains I’ve made this year, but my finishing time was exactly one minute slower than 2014. A lot of other people had similar stories of being way off on power; of course, many had done a better job of anticipating that than me and had planned accordingly. Officially, at 57:23 (my head unit, oddly, showed 58:30 and the course at about 250 meters too long) I was the winner of the P12 category. Allison Atkinson (ATC Racing) was the only other person racing the cat, though, so there was no prize money for us. While I wished we’d had more competition out there, at that point I definitely wasn’t blaming anyone for opting out. Team time trials, unlike ITTs, are actually fun, and I don’t understand why more people don’t do them. A TTT is an interesting formula in which you try to get the best out of everyone, and while there are lots of ways to get that wrong and maybe only a few ways to get it exactly right, the process of trying is genuinely enjoyable and educational. You’re not out there suffering alone, and you have your teammates to encourage/curse at you. Compared to an ITT, the miles float by. Like last year, I was signed up for the TTT with ATC Racing (now state champs three years running), but this time I was guest riding in my hot pink Visit Dallas Cycling p/b Noise4Good kit and there was a completely different squad of girls in the orange and black: in 2014, it was Missy Ruthven, Marla Briley, and Maggi Finley, and for 2015, it was Christie Tracey, Allison Atkinson, and Katie Kantzes. We were the only team signed up for the P12. We’d also had no practice riding together on TT bikes, as we’d made the decision to race the State TTT together only two days prior. Our plan was to keep things casual and fun, but also as fast as we could go. The starting rotation was me, Christie, Allison, and Katie, who was on a road bike. I probably started out too hard again, and though I knew better, it’s hard to curb yourself with so many unknowns. With the headwind on the way out, I felt like I was pushing against a wall. Christie seemed comfortable—probably too comfortable—tucked in behind me (she'd put in a great individual time the day before), and I worried I was actually slowing us down. I shortened my pulls, feeling better within a few rotations, and then ramped the intensity up when I was on the front to offset the fact that I was spending less time there... This approach was, obviously, a mistake, but I'm not sure my brain has ever functioned correctly during an all-out effort. My teammates were working too hard, and even when they pulled through quickly, they were getting a big dose of the wind. I was also accelerating too much when coming back to the front. Katie, a phenomenal rider, was having a bad day—she was the only one on a road bike, not to mention the crazy heat. She fell off before the halfway point, which none of us realized until it was too late. The TTT time would be determined by the top three riders, so now we couldn’t afford to lose anyone else, but we struggled with this. Two or three times we let a gap form and had to slow to let the rider catch back on, also making the mistake of slowing too much and breaking her momentum as she regained... We probably would have had a better idea of where to set the pace if we’d ridden more together beforehand and could have made a lot of small improvements throughout the effort to add up to a substantial time savings; overall, however, we had a fast time (58:04) and a good race. We worked well together. My son, Theo, stood up on the podium with our ATC Racing team. 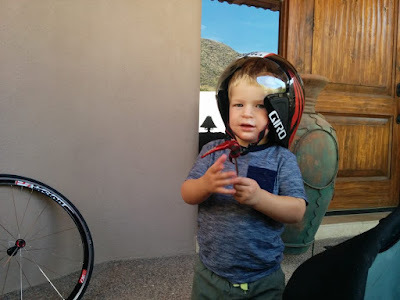 He’d been running my husband ragged for two days of racing, and Jack had managed to help with team equipment and preparations in spite of it all. I owe him big time, especially since I forgot it was Father’s Day… Again and again, Jack has picked up the pieces for me this year and kept me rolling. Next up for our little bike-racing family: the three of us will travel to Bend for the Cascade Cycling Classic, July 22-26. The 2015 Duathlon National Championships are past, and it was another great experience in my life. It turned out to be a very challenging couple of weeks just getting ready to go with all the flooding in the area; as a firefighter, I was really busy. I got off shift on Wednesday evening around 9 p.m. to start the 1,200 mi drive to St. Paul knowing it was going to be a quick turnaround trip. I had planned to be there Thursday afternoon so I could get two good nights of rest, but my truck got a fuel leak outside of Dallas around midnight, and I found myself in the IHOP parking lot wondering if I was going to make it at all. I stayed miserably in my hot truck all night, and thanks to Google I found Gillette Automotive in De Soto, who got me out in a few hours on Thursday morning. I could make it yet. My friends Brian Zahm and Angela were way ahead of me in Iowa, and here I was 1,000 miles away leaving Dallas. With a quick stop in Irving to pick up a bike for transport for my good friend Monte I was off. Many naps and multiple thunderstorms later I arrived at the venue on Friday afternoon around 1:30 to pick up my race packet and do openers on the course. Before I knew it, it was 4 p.m. and I hadn’t even been to the hotel yet and was really feeling a bit rough. Before I left I saw Jeff Gaura, Mike Kostenik. and Mike’s girlfriend; seeing these friends was a real pick-me-up. I drove to my hotel (in traffic of course), got checked in, found an Olive Garden and ordered takeout, and was back by 8 p.m. I was whupped by this point and I hadn’t been there six hours. Thanks to Chris at ATC, I knew my bike was race ready, so it was a standard race night prep. I was in bed by 10 and slept till 5 a.m., and then it was race day, thank god. I met Brian and Angela at the venue parking lot at 6 a.m., where they laughed at how someone can eat beets, oatmeal, egg whites, sweet potatoes, and brown rice at 6 a.m. I needed all the help I could get on this one. I was early in transition, and then I started seeing people I hadn’t seen in a while, including my good friend Bob Jones. As he said in his own race recap, it has become a tradition for us to do our pre race warm-up together. 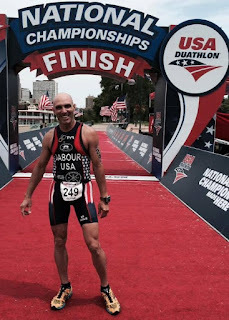 He is an outstanding athlete and fellow age grouper, and I’ve been chasing him for three years now but am getting closer. I was feeling very calm and relaxed that morning, and this was a good thing, though it was probably from lack of rest. a very quick start, but I stayed in control and settled in behind Bob to finish the first run in 18:57. That put me in eleventh, three seconds behind Tony Prado and 22 seconds behind Bob. (I told you these guys are fast.) With a quick transition I managed to get out ahead of them, but Bob came back on the long climb that we would make three times. On the long downhill leading back to the river, I managed to pass Bob again. After a very steep sweeping downhill that cut back to the opposite direction, there’s about a 4-mile stretch along the Mississippi river back to the long climb. Here I was riding near Bob Jones, Tony Prado, and Bob Brown (who’s in a division up but seems to be in our mix). These guys were seesawing back and forth and went into transition about a minute ahead of me. I started the second run feeling good, and I was hoping I could make up a couple of positions, but as I made my way through the U-turns I could see Bob was doing really well and Matt Kellman, who I’d gained on some on the bike, seemed to be running strong. On lap two I managed to pass Bob Brown, and though he wasn’t in my division, it felt like it, and I had Tony Prado in my sights. Tony seem to be slowing and by closing hard I managed to finish nine seconds behind him, finishing 12th. The 12th place finish was my third consecutive 12th place finish in three years. Tony and I are always so close at the finish, but I have yet to beat him. He is a great person, and I’m happy to compete with him. 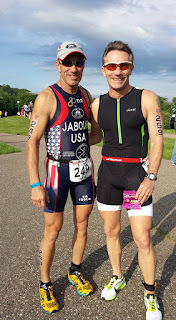 I will see him in Florida in December for Powerman National Championships for long distance, and I am sure it will prove to be a close competition between us. 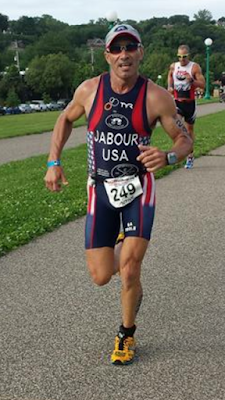 The 12th place finish qualified me for Team USA for the 2016 Duathlon World Championships in Aviles, Spain. This will be my third World Championship with Team USA. I will also go to Adelaide, Australia, in October for the 2015 Duathlon World Championships later this year. I feel blessed for the people I have met and to be able compete at this level. My coach Gray Skinner of Enlightened Performance, who I have been coached by for over two years, has brought me to a level I used to only imagine. He has transformed me both mentally and physically for the goals we have achieved and the goals ahead. Learning from him I have also coached a few athletes to division wins in their first races ever, and it’s an amazing feeling to watch them grow. So this one is in the books, and just to top it off, at the awards ceremony 87-year-old Ed Maruna went up to receive his award, presented to him by his son Dean. This is just an example of some of the amazing people in this sport, and I hope that I am blessed to be able to compete as long as Ed has. The completitor, the bucketlister—these are a few of the derogatory terms used for someone "serious" athletes would describe as a tourist, a wannabe, a one-and-done visitor to a sport. Nothing riles up the elites more than when a completitor claims to have conquered the beast in a few short days or months of competition, ignoring the years of hard work it takes to really get to know it. I used to look down on people who seemed like they were merely ticking accomplishments—marathons, triathlons, ironmans—off of a bulleted list, regardless of finish time, or whether they walked all or a portion of it. You’re not "really" doing a sport unless you’re doing it well, right? But maybe all those naysayers, including me, were wrong. By now I’ve logged enough hours and won enough (bike) races to count myself among the faster, more serious set. I’m also experienced enough to look back and see where I missed what was truly important. You’re good at a sport? Great. You have the time and the money to do it? Fantastic. Now ask yourself whether you love it, and figure out how to keep loving it. Unless you’re making a very healthy salary being an athlete or winning gold medals, those are the only two things that matter. In some ways the one-and-doner gets more at the heart of amateur athletic competition than the veteran athlete does—participation may be short-lived, but it's always fun. Human life, at some very fundamental level, is about learning. It’s what we were built for. We like to touch and see and taste new things. We like to take those things apart and put them back together again. We enjoy testing ourselves and finding out what we’re made of. And that’s why sport exists. It’s an expression of our humanity, a catchall for emotions and energy, a celebration of what makes us tick, physically and mentally. Yes, there’s honor in hard work and focus, but there’s also a great deal to be said for experimentation. It takes courage to try something new, especially if you suspect (or know) that you’re not particularly talented at it. There’s also reality. Not everyone has the budget or the time to focus on a sport day in and day out, but they might be able to give it the six months or so it takes to accomplish that one race or goal. The experience of getting from point A to point B, whether you’re talking about the preceding training or race day itself, is a beautiful thing. Let those who seek that, have it. And not only that, enjoy it yourself if you’re one of those select mega-achieving athletes. Venture into something new—attempt kayaking, mountain biking, adventure racing, extreme Frisbee golf. Break up the road or tri season with cross training that keeps you excited about your principal sport and fitness in general. Every echelon of endurance sport has something to learn from the others: The elites should recognize that their sport’s bread and butter is the masses. In bike races and multi-sport events, there’s only one winner for every 100 participants or so – the money that keeps the wheels turning is coming from the people who are doing it for the good times and the good stories. As an elite, you should respect their very important part in what you do. And at the opposite end of the spectrum, beginners should acknowledge that their investment and understanding do not necessarily equal that of an athlete who’s devoted body and soul to the sport. Consider experienced athletes an easy resource. Most of us started from the same place, even if we no longer care to admit it. We saw a challenge and we thought, "hey, that would be cool." We went into it blundering and clueless, and somewhere along the way we found our feet. Wherever you’re at on that timeline and no matter how short it may be, hold on to the joy that was its reason for being and share it with others. 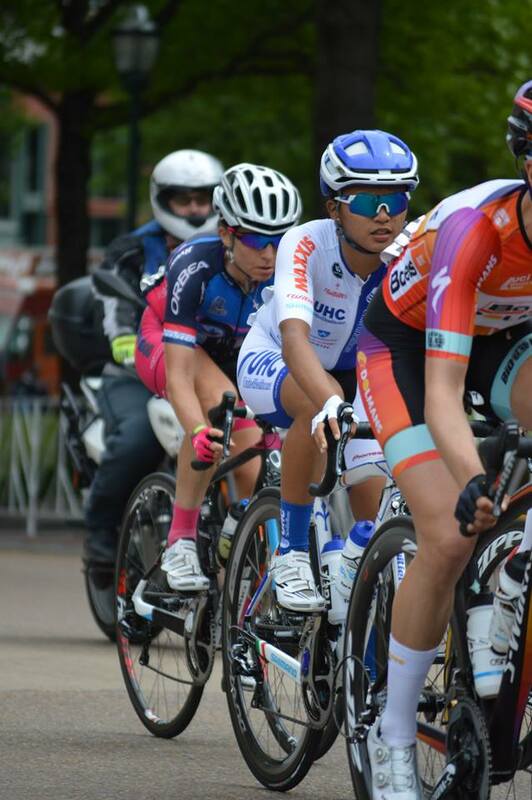 At races, sometimes I look around at the women in the pro peloton and wonder how they stay in love with the sport day after day, year after year, crash after crash. No money, very little fame, and so much work… This season, my first racing at this level, has been a struggle, and I have a much lighter race schedule than most. Like the majority of women pros, I’ve got a few other hats to go along with the helmet. I find myself resenting the toll that the training and the racing takes: the time away from my son, the strain on my marriage and writing career, the injury and fatigue, the expense, the intense pressure, and of course the many disappointments and failures that outweigh any successes ten-fold. But even in the darkest hours, it has its moments. 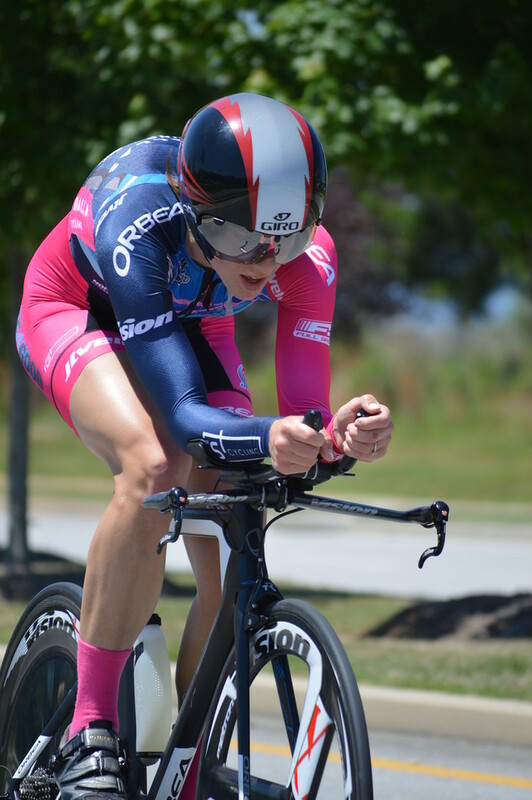 The national time trial and road race championships in Chattanooga, Tennessee, on May 23 and May 25 were not good results for me, but along with my disappointment, I left feeling a sense of honor. 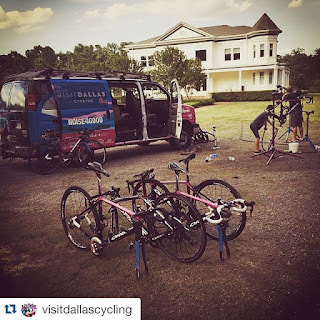 I’d raced two national championship events with the best female cyclists in the country, and I was part of a really good team, Visit Dallas p/b Noise4Good. 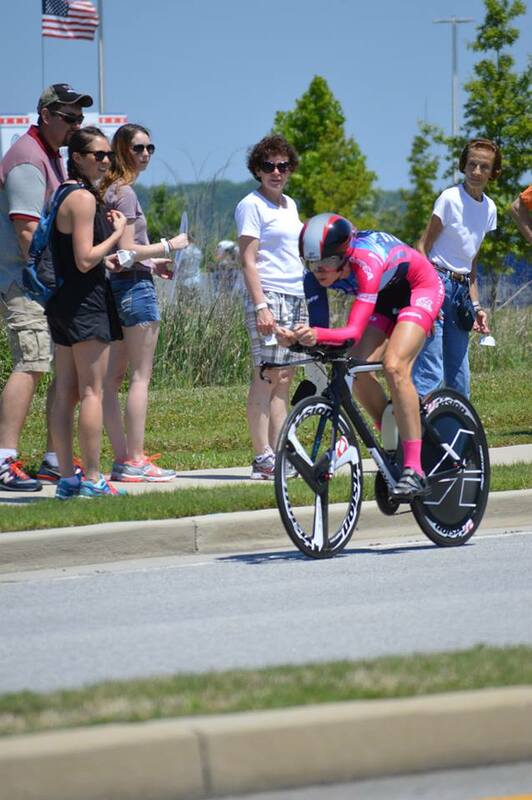 In the time trial, my teammate Amber Neben—former world time trial champion—was on the podium in third. In the road race, my teammates Beth Ann Orton and Anna Grace Christiansen were in the early “TV” breaks, Anna Sanders made the selection the first time up Lookout Mountain to finish 15th, and Amber was the driving member of the winning move, placing fourth overall. Racing as a rookie in the pro peloton, I find myself on the rivet more than I would have imagined possible. I can’t describe the pain well enough to do it justice. See me in person, maybe, and we can experiment with boiling water and a table saw? There’s an end to every tunnel, though, and while I probably won’t come away with medals and tales of personal glory, I’ll have the memories of, however briefly, being in the midst of it all. I used to think of myself as a time trialist, the longer the course the better, but on the national scene, very short, prologue-style TTs are my wheelhouse. 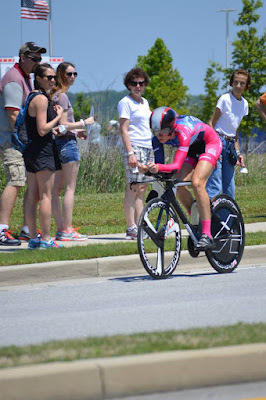 I don’t have the aerobic engine that the true time trialists do, and if it’s too steep or too long of a hill climb, the “little people,” as I call them in my head, have the advantage given my height. My recipe for success—which for me is a top 10 finish on a TT versus a top 25—is short, a little hilly, and not technical. So if you were to say that my recipe for a perfect TT was the makings of a chocolate pie, the Nats TT course would have been eggs and grits with a side of bacon: 19 miles long, mostly flat, with lots of turns. I had limited expectations. But knowing that I wasn’t going to podium didn’t change the fact that I wanted a respectable time. 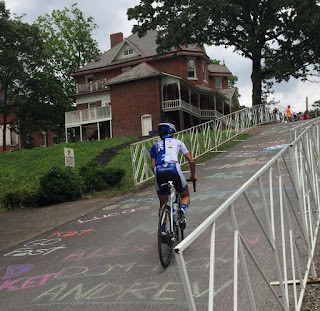 This is the third year Chattanooga has hosted the national championships, so most riders and teams were familiar with the courses. I’d gotten to pre-ride three times the day before and once the morning of, so I was too. 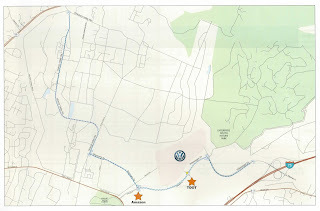 The course was two times around a 9.5-mile loop with a total of eight turns per lap (including turnarounds): starting at the Volkswagen plant, going through an industrial sector, continuing on to a lonely, wooded road, and then turning around to go back through it all again to pass the start/finish on the other side, go up a hill, go down the hill, take a nasty left, and then a short straight to the line, at which point you either started your second loop or were done… If you’re a little confused, just wait till I describe the road course. I didn’t feel half as good the morning of the TT as I had during my warm-up the day before. I knew, however, that the way I feel before the start often has no bearing on how I’ll perform in a TT, and I told myself this as they sent me down the ramp and out onto the course. But I couldn’t settle into a rhythm physically or mentally. I knew I was taking the corners badly, and I knew the riders who started one minute ahead and one minute behind were putting time on me because I could see where they were in relation to me at the turnarounds. The course felt so long. Just as I hit the next-to-last stretch of road on the last lap—a gradual climb where I knew I needed to start wringing out what I had left in my legs—I noticed a rider to my left moving so slowly I thought maybe she wasn’t in the race. I’d never been passed so…microscopically. I knew she had started a couple of minutes back and would be far higher than me on the standings, so eventually I eased off a bit. But when she was ahead, she slowed even more. I’d gone from about 265 watts to 245, and I could feel my heart rate coming down. Here, at the end of the race! I also worried I’d get penalized for drafting. I didn’t want to interfere with her race, but mine wasn’t over just because she was ahead of me on the clock. I decided to pass before the next wide turn through the rotary, but as I started to go around to the left, she sped up again and said in a clear and catty voice, “You can’t get in my way!” If I’d been physically able to speak, I would have said, “Well, GO then!! !” I followed her through the next two turns, which she also took slowly, and she left me on the big climb. My head was in a fog. Feeling angry and frustrated and despondent, I rode to the right on the climb because I knew my teammate Beth Ann would be passing me soon as well. Instead, within seconds it was my other teammate Amber Neben blowing by like a train. She’d started FOUR minutes behind me. 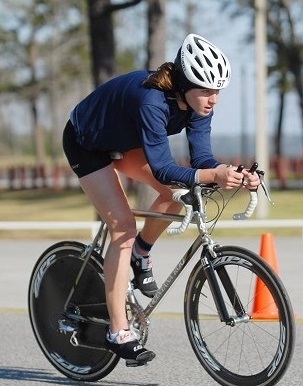 (She would finish 18 seconds back for third place behind Armstrong and Carmen Small.) Now everything that I usually felt at the end of a time trial—that final burst of adrenaline and excitement and generally wanting to die—was replaced by an overwhelming sense of defeat. Beth Ann was coming around too. I’d been swarmed, passed by all these better, faster riders like a centenarian on a mountain bike. And then, perhaps too late, I remembered this was the last chance to empty the tank, since the downhill and turn into the finish was fast. I repassed Beth Ann but she was close behind at the turnaround, which I of course took slowly, so I just ended up getting in her way. By that point I felt like my race had been one giant sinking ship. I wanted to cry after I crossed the line, but I didn’t. The tears came later that night. 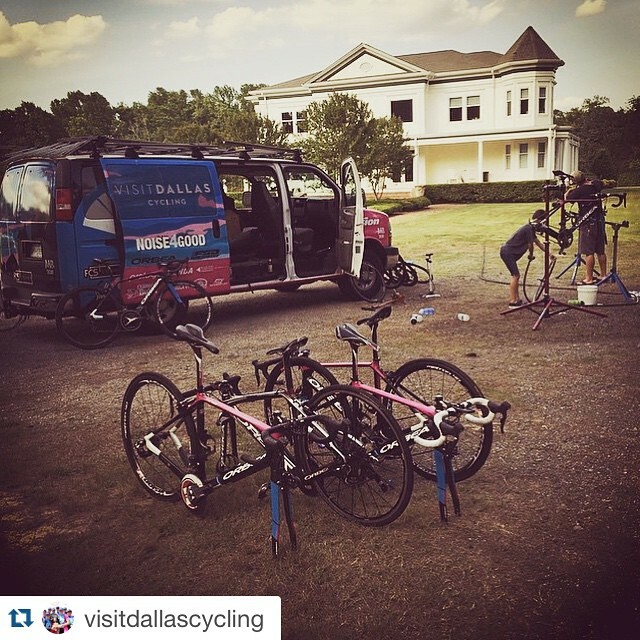 One of the biggest adjustments for me this year has been the nature of travel and accommodations at national events. Racing in the past, I always had a car, and I usually had a separate place to stay. On a pro team, you end up sharing space and food and sometimes a bed with other team members. Housing can be a luxurious mansion with a host family feeding you every night, or a crowded motel with bed bugs and cigarette burns on the sheets. I’m a light sleeper (which wasn’t a factor at Nats because I had my own room at a very lovely host house), the only vegetarian on the team, and an introvert who needs independence and quiet time like oxygen and water. These national races make me feel like a fish who’s not only been taken out of its bowl, but put in a circus arena to perform on the trapeze. After the TT, Beth Ann and I stopped by Wal-Mart, then went back to our host house with just enough time to eat a small lunch and take a rushed shower before we drove to the central host house for massages. In the world of pro cycling, massage between and before races is considered a necessity. I’m not accustomed to the practice at home, but I like it under normal circumstances. This day, however, I was feeling like I should have opted out in favor of a nap. Beth Ann said she was tired too, and why didn’t we just take the car and go grab something to eat in town when we were both done with the massages, and then go straight back to our house? This made me happy because it put what I would eat under my control, and it meant getting to bed early. I played around on my laptop for a while, but when I went in search of Beth Ann after a few hours had passed, she said the plans had changed and Amber had gone to the grocery store to buy steaks. The word “steaks” hit me like a wrecking ball. Now it clicked, why Amber had asked if I needed anything, and said she’d get me veggie patties. It would be eight at night before we even started cooking. "Don't worry, you'll grow into it." I started putting peanut butter on a dried-out bagel in the kitchen, and that’s when I lost it. I ducked out of the house and behind some bushes so no one would see and I wouldn’t have to explain why I was crying. Even I wasn’t sure. Was I crying about red meat, or because I was tired, or because I wished I could be with my husband and son? Was it because I’d disappointed myself in the TT, or because I’d disappointed others? Was it because I’d had a bad race, or was it because I’d had a bad season? This is one of the most unfortunate things about female biology, or mine at any rate—emotions and frustrations turn into tears that only serve to cause further distress and embarrassment. What’s nice, at least, is that most women cyclists will tell you they’ve had these moments and you’re not alone. I asked Beth Ann to ferry me home in the car. In the end, I didn’t have the energy to make more food, so I ate a bowl of cereal and some snacks and went to bed. The Nats road course was remarkably complex. Even after a pre-ride with the team on Sunday, looking at the map it didn’t completely make sense to me. So I went with the strategy that’s been my modus operandi all year: I’d just cross that bridge when I got there. 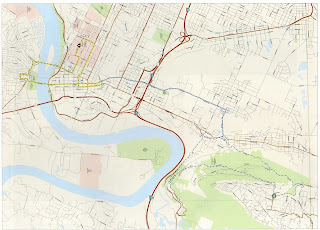 Three circuits in downtown Chattanooga, two big loops (which included most of the circuit again), and three more circuits downtown: that was the big picture. 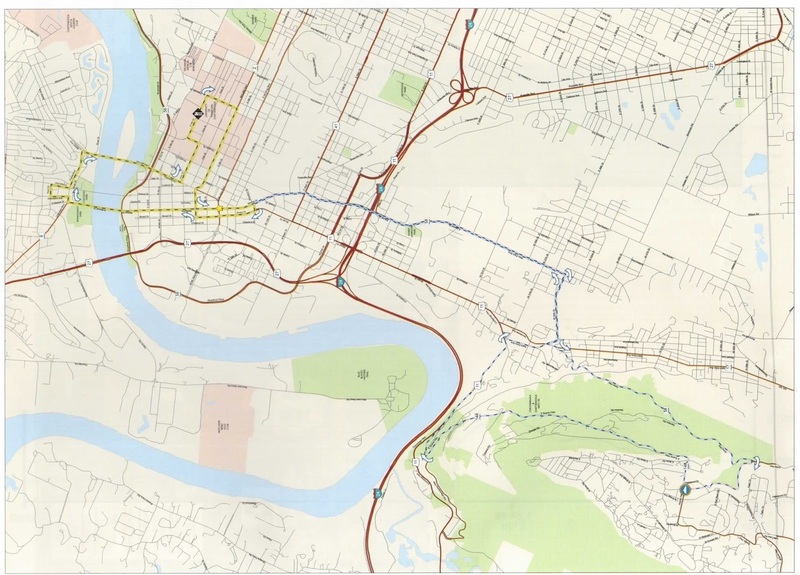 The circuit downtown would be crit-like, with lots of turns, and at one point overlapped itself. Across a bridge over the river was Kent Hill, a steep wall that we would crest each lap for a total of eight punches to the gut. Jack had somehow commissioned a chalked “Kat Go Fast” on the pavement there. My two-year-old son’s way of saying “Go fast,” one of his favorite phrases, is unique—I knew I’d hear it in his voice if I had the opportunity to see the chalk on the way up. The two big loops would take us up Lookout Mountain, with something like 1,000 feet of climbing in about three miles. The descent after was long and twisty and very fast. At the bottom we would head straight back to downtown and Kent Hill, and then back up again to see Lookout Mountain one more time or, on the second big loop, would start the finishing circuits. All total, it would be about 70 miles. My plan for this challenging and complicated course was simple: stay with a group because otherwise I might end up in Georgia. At the start of the race I was shuffled rather quickly to the back, though at times I worked hard to not be the absolute caboose. The worst part was going down the steep hill after Kent and into the left-hand turn at the bottom. The field would string out there, and the most I could do was tuck behind someone who still seemed to have forward momentum and hammer. After the descent, there was a gradual uphill and a right turn onto a windy bridge, so it was a fairly long stretch of hard riding. Amber in the winning break. I’ve come to understand that in the hour or so before a race I often channel my nervous energy into an obsession about something that’s still under my control, like whether I should or shouldn’t eat something, or going to the bathroom as close as possible to the start so I won’t have to go during the race (since I’m also obsessive about missing a start time, that means I’ll line up at the porta potties to pee, then line up again immediately after if I see there’s still time to go again). Before the Nats road race my fixation was saddle height. One of the problems with flying a bike is that you have to take it completely apart and put it back together again when you land. Something had felt off on Sunday's pre-ride, and that morning before the race I decided I would measure my saddle and adjust it because I wasn’t sure the electrical tape I’d marked it with was right. But then after I did, I was worried the eleventh-hour change would be a mistake, so I moved it back… My saddle immediately felt fine as soon as we were on the road, of course, but within a mile or two I could tell something was off with the shifting. I hadn't noticed it warming up on the trainer, but when climbing—especially when we reached Lookout Mountain—my two easiest gears would skip, and were essentially unusable. On the first three circuits, each time we approached the Kent Street hill I made an effort to shift as early and smoothly as possible. The hill was steep enough that you’d have to run your bike up if you didn’t have momentum coming into it, so one of my worst case scenarios was dropping my chain near the bottom and having to jog up past all the spectators. I’m not a cross racer. The first time we got to Lookout Mountain, the group seemed mostly together, but within a few minutes riders were quickly shedding one by one. The climb is long and brutal, and as you take a right turn onto the last section to the top, it seems to be at its steepest. What do you tell yourself, when everything hurts and your resolve begins to slip? What excuse do you embrace and hold tight to your wounded ego? Your shifting, your bike, your breakfast, your warmup, your coach... And then, about ten seconds later, when your resolve breathes again as you see your competition ride away from you? Your pride spurs you forward and you're moving again, but by then it's too late. I was close to the group at the top. I could see the selection of 20 or so riders reach the stop sign and take a right turn onto the descent. I really wasn’t that far off, I told myself. I could make it back. A photo in Cyclingnews shows me at that point with a painful grimace riding just behind Carmen Small (Twenty16)—said to have been feverish and throwing up the night before, which explains why she was in my neck of the woods. But no…there would be no catching up to anything with my Texas-born-and-bred descending skills, and I knew as soon as a few pods of riders had rocketed past me that even if I’d made it to the top of the climb with the group, I wouldn’t have been able to stay with them after. Taylor Phinney crashed on one of the turns in the 2014 race and broke his leg. I figured attempting top speed was another good way for me to end up in Georgia, this time by impromptu flight. 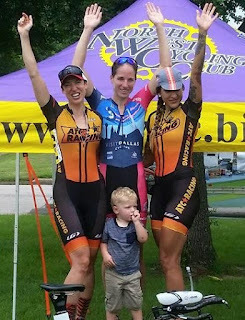 By the bottom I was with two other riders, one of whom I recognized as Julie Emmerman (Rally Sport Cycling Team). We could see a group of other stragglers up the road. Not knowing that Twenty16 riders were setting a hard tempo at the front of the peloton, I still had the hope that we could catch back on. This is where I left the rest of my legs, I think, taking big pulls and steadily digging a hole for myself that I wouldn’t be able to crawl out of. We caught the handful of other riders that had been ahead of us close to the bottom of that hateful Kent Street wall. Here I started to realize that I had cooked my goose, and even as I saw the “Kat Go Fast” chalk for the first time, I knew I was beyond encouragement. I was at the tail end of the little group and slow through the turn at the bottom of the next hill with enough of a gap to lose them, and from there until we reached the bottom of Lookout again—which was a really long and lonely way, I might add—I was completely on my own. We’d been warned that the officials would “ruthlessly” pull us from the race if we were outside of the caravan or in danger of getting lapped on the circuits. I’d kept the group at a steady distance for a while, really pushing again because I thought the officials might pull us at the start/finish...but no, my wooden legs were going to see every inch of that hateful mountain again. At the start of Lookout, a group that had been behind caught me, and many of them passed me, and then more passed me. I trickled down the mountain and onto the flat with the last wheels I could hang on to, and when they finally pulled us at the start of the downtown circuit I gave a silent cheer and leaned over and let my lower back spasm for a bit. Usually I’d always rather see a race through to its end, but not this one. I watched my teammate Amber’s performance on the final circuits from the TV screens at the finish line. They’d televised the entire race, and the broadcast was of very good quality. I learned that Amber had pushed the pace so hard the second time up Lookout that she'd blown the field completely apart—only five riders were left in the lead group going into the final circuits. It was Evelyn Stevens and Megan Guarnier, both on Boels Dolmans, Tayler Wiles (Velocio-SRAM), and Coryn Rivera (UnitedHealthcare). That left the remaining Twenty16's and a host of other incredibly talented riders chasing for no better than sixth place. Evelyn Stevens made a strong solo attack late in the race on Kent Street and got away until just a few kilometers to go. Amber worked hard to catch her, with all but Wiles just sitting on, and then after Stevens was caught, aggressively tried to initiate another move. When Amber, Rivera, Wiles, and Guarnier were coming to the line for a sprint finish, I knew that Amber would take fourth, but I also felt like it had ultimately been her race. She’d laid everything on the table, and the gamble hadn’t worked out perfectly, but she’d played to win. Guarnier and Rivera came to the line neck and neck, with Wiles following close behind for third; Guarnier would go home as national champion. You can read Amber's full report here, a nice change of pace since it’s from the front of the race rather than the back.